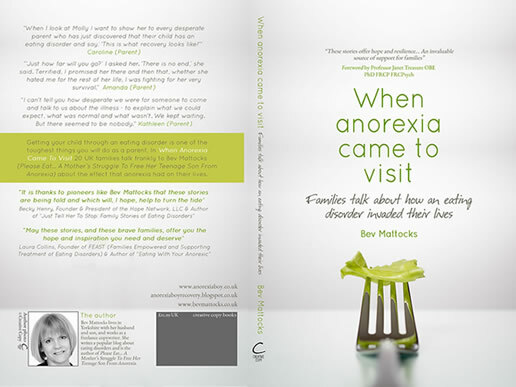 Eating disorders in boys are on the rise, Bev Mattocks' son developed anorexia at the age of 15 and is now recovered. Eating disorders in boys are on the rise. In 2009 my 15-year old son developed anorexia nervosa. Now, aged 23, he is recovered from his eating disorder. My name is Bev Mattocks, my son's name is Ben and this website tells our story. Ben's struggle with anorexia began in 2009 when he was 15, but back then we had no idea that boys get eating disorders or what the typical symptoms of eating disorders in boys look like. I've written two books about eating disorders. I also blog about eating disorders in boys to help other parents to identify the symptoms of anorexia in boys. My name is Bev Mattocks. I'm the mother of Ben, a young man who developed anorexia in 2009 at the age of 15. Today I write and speak about eating disorders to help raise awareness of the fact that boys get anorexia too, just like girls. Ben's struggle with anorexia began in 2009 when he was 15, but back then we had no idea that boys get eating disorders. 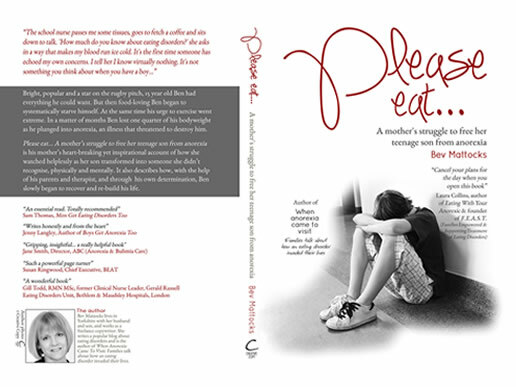 'Please eat' is our story and 'When Anorexia Came To Visit' tells the stories of 20 other families battling with an eating disorder. 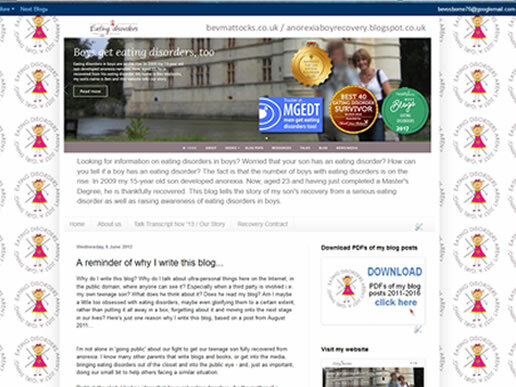 My blog aims to raise awareness of eating disorders in boys and help parents to identify the signs of an eating disorder. Download free PDFs of my blog posts from 2011-2016 - much easier than clicking through the archive! Join my Facebook page to keep in touch and meet other parents in the eating disorder community. In January 2011 my son, Ben, was still in the throes of his eating disorder although, on the face of it, he had begun to engage with eating disorder therapy and 'want to recover'. The only problem was that the anorexia was too strong for him and it would be a further 14 months of eating disorder treatment before he was discharged - and even more months before we could claim that he was in remission from anorexia. So in January 2011 I began to write a blog which I called Anorexia boy recovery which documents our day to day experiences as Ben began to emerge from his eating disorder. The reason I began the blog was - as I say in one of the posts - "Right at the start, I had no ideas that boys got eating disorders. As the mother of a teenage boy, anorexia didn't feature on my radar. And I guess it must be the same for many parents of teenage boys. You simply don't expect anorexia. You don't event THINK about it. Right from the start I was acutely aware that I wanted to do my little bit to help parents just like me - not only to help direct them to useful eating disorder resources but to talk about my own experiences so they can see there is a light at the end of the tunnel." Eating disorders in boys under the age of 18 is on the rise - or at least those boys that have managed to get a diagnosis and receive treatment for their eating disorder in the UK. In 2017 there is also more awareness and understanding of eating disorders in boys, helped by charities like Men Get Eating Disorders Too, media reports and (hopefully!) my blog: AnorexiaBoyRecovery which I began writing in January 2011 a year after my son, Ben, began to receive treatment for anorexia. But, back in 2009 when Ben began to show symptoms of anorexia, I had no idea that boys got eating disorders, so I didn't recognise the warning signs. As the parent of a teenage boy you don't expect your child to get anorexia or any other eating disorder. You don't even think about eating disorders and especially eating disorders in boys. When I sat down to write my book Please eat... A mother's struggle to free her teenage son from anorexia I was acutely aware that I wanted to do my bit to help other parents and carers - not only to identify the warning signs of anorexia in boys but to show that recovery from an eating disorder is possible and to describe how we got there. I also wanted to highlight the importance of early intervention for anorexia and effective treatment for boys with eating disorders. As we struggled to get my son through anorexia I was supported by a wonderful online community of other parents who had been through an eating disorder - parents of girls as well as boys. It quickly became very clear that getting your child through an eating disorder is one of the toughest and most distressing things a parent will ever face - and in When Anorexia Came To Visit: Families Talk About How An Eating Disorder Invaded Their Lives 20 of these (UK-based) families agreed to talk to me about their own experiences of dealing with an eating disorder in the family. Of course each family's circumstances are different. Yet so much of what we have experienced is similar. Not just in terms of the warning signs of an eating disorder but in the way the illness transformed our sons and daughters into people we scarcely recognised, mentally as well as physically. And, of course, the sheer uphill struggle of trying to help them to recover from their eating disorder. "I want to help parents to recognise the signs of anorexia in boys and get urgent help. I want to show that recovery from an eating disorder is possible and to describe what worked for us."